Blog updated on March 11, 2019 1 Comment Any post on this site may contain affiliate links. If you use them they cost you no extra. We make a small commission. Sri Lanka is known for many things, tea production, elephants, great beaches and of course the wonderful welcoming people who call this little island home. We were here to see as much as possible and we certainly saw our fair share of Sri Lanka’s southern beaches. From Hikkaduwa right around to Tangalle, we stayed on numerous beaches and loved the beach lifestyle Sri Lanka offered. As tourism increases beaches like Mirissa aren’t quite as nice as they were which is a shame. Looking south along lovely Mirissa beach. Our personal favourite. 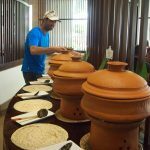 Hikkaduwa has been attracting tourists for as long as tourists have been visiting Sri Lanka. 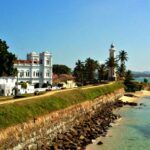 In fact it was mentioned as early as the 1840 as a holiday escape from the city port of Galle. The 1960’s saw another big push with hippies from all over the world converging on the surf beach. Since then it has gone from strength to strength. Hikkaduwa proper has now swallowed up the surrounding towns and stretches along the coast continuing south for at least 8km (hotels this far south still say Hikkaduwa, although this isn’t actually Hikkaduwa proper). The beach is a mix of a working harbour at the start with some good snorkelling and diving offshore. Heading further south you have almost endless surf beaches on which to catch a wave. The water is rough and can be dangerous for inexperienced swimmers. More than one struggling tourist has been pulled from the waves by local surfers. The choice of hotel and restaurant is only limited by your budget. Cheap options are there but you need to hunt around to find them. The cheaper places are back off the beach on the side roads leading into the jungle interior. The restaurants and hotels that are right on the beach are great if your budget stretches that far. An increasing amount of UK and European package tourists are flocking to the island and this part in particular. 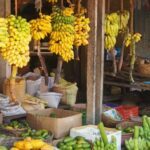 The increase in trade is great for the locals but drives up prices for budget travellers. Cleaning turtles. 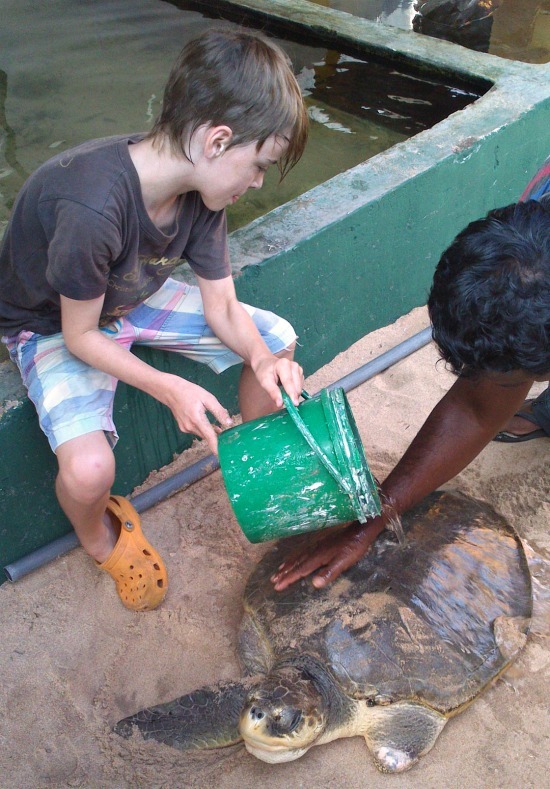 D gets up close at the turtle hatchery at Hikkaduwa. 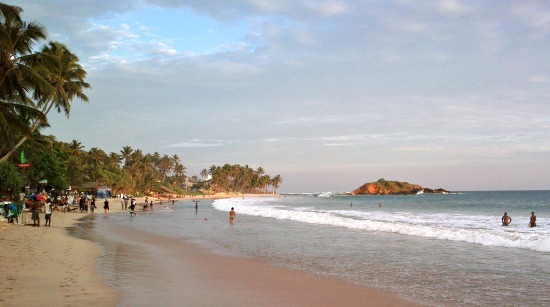 Sri Lanka’s Southern Beaches, Mirissa the Southern Tip. Mirissa is our favourite beach town. It seems to be least developed, the beach and you can go whale watching from here. It is like Hikkaduwa, 20 years ago. We spent two periods of our travels here. Once on the way down the coast and another when we came back to revisit for a few days before we flew to the UK. 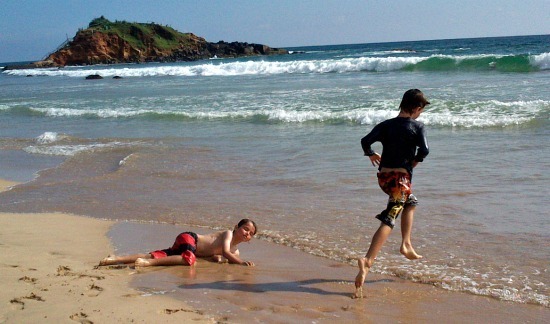 The beach has big waves but they are manageable and both our young boys loved them. For the serious surfer you can head to the end of the beach where the break creates both left and right handers as it goes either side of a rocky outcrop. Surf boards are available to hire, as are lessons if your new to the sport. 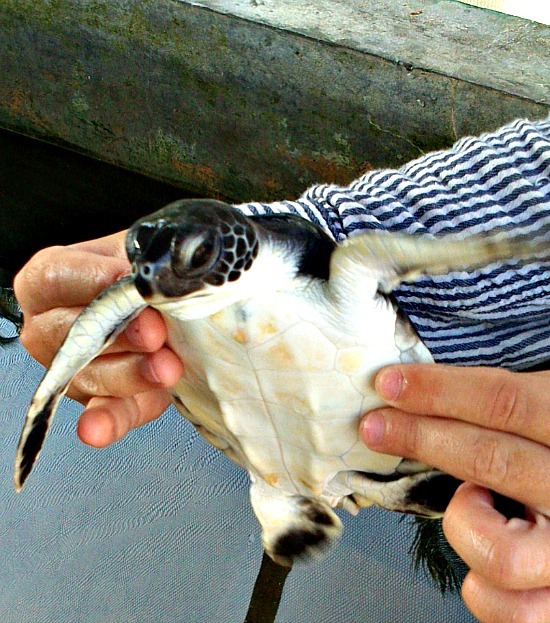 Boo gets to hold a baby turtle before they are released into the wild. At night the beach comes alive with restaurants setting up on the sand as close to the high tide mark as they dare. The food was a bit hit and miss but we found our two favourite restaurants and stuck with the two. Each had a massive display of seafood, which on the right day was fresh and inviting. On the wrong day, sit up wind is my advice. 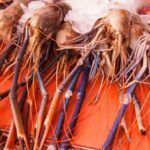 Like most of Asia you seem to be able to buy almost anything. Menus run like a short novel. Stick to what they know and it will normally be good. We stayed just back from the beach in a lovely room with en-suite bathroom for under $20 a night. 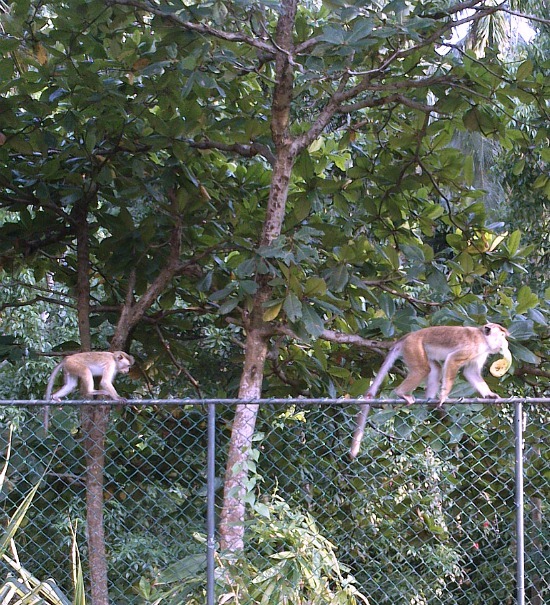 We even had monkeys roaming around which the owner would routinely chase them away with his ‘monkey stick’. Tea could be delivered each morning for a few dollars and the WiFi was good as long as you were on the veranda or in the restaurant. If you had more cash to spend there were plenty of hotels along the beach to choose from, these varied in standards from posh hotel to cheap dorms. Cheeky monkeys eating fruit at our guest house in Mirissa. Mirissa was also the place we saw blue whales up close. If you don’t see any whales they will give you a refund so we thought we couldn’t lose. Alyson spotted a fleeting glimpse of a right whale on the way out. No refund now. After another 30 minutes we thought that was it. Suddenly we saw a massive splash and tail appeared in front of us. Soon we had seen no less than 3 blue whales. Considering that only a fraction of their tail actually comes out of the water these were huge mammals. It was amazing to see them in their own habitat going about their business as if we didn’t exist. Tangalle was as far as we went on the coast. While not on the east coast it is more than half way there. 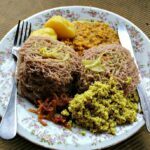 Everyone had raved about Tangalle but we didn’t see the appeal after coming from Mirissa. The beach and area in general suffered badly after the Tsunami which devastated so much of Asia. While the beach was back to normal it wasn’t a lovely crescent like Mirissa and not good for swimming with the waves just dumping straight on shore. Boys will be boys. Playing in the waves and shallows of Mirissa beach. Hotel wise there were plenty to choose from, but no customers. The beach area was all but deserted. We found a nice hotel but the total lack of life killed it for us. I wonder if the government had given out money to rebuild and everyone had just built a hotel but not thought whether people would return. Tangalle is a lot further and harder to get to than Mirissa and isn’t on the way to anything, making it a tough place to market for tourists. We eventually found a lovely place for breakfast with great coffee. Being a major tea producing country, coffee, in general tastes terrible here. The roti and European coffee was made even better by the owners Carom board. We all learnt to play, loving it so much we ended up buying a board to take back to the UK with us. Sri Lanka’s southern beaches are one of the main draws for this little island paradise. We certainly have fond memories of our time there and can’t wait to return.